Size: 2,040 sq. 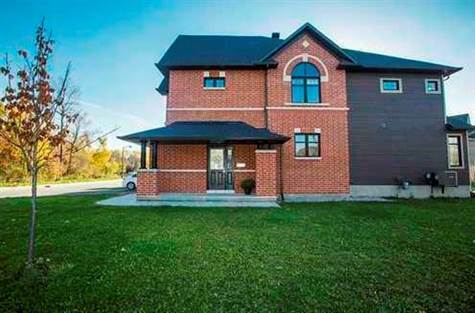 ft. "As per builders plans"
Located in the desirable community of Trailsedge, this 4 bedroom + den home sits on an oversized premium corner lot . Featuring gleaming hardwood throughout the living room and dining room. Sun filled kitchen with eating area. Beautiful master retreat featuring 4 pc ensuite & walk in closet. Lower level family room complete with gas fireplace. Perfect for the growing family with no front neighbours. The Crossroads of Convenience and Excitement. Located just minutes south of Innes Road, you’re never far away from a plethora of shopping destinations, movie theatres, or exquisite restaurants. For the sports enthusiasts, Minto Enclave offers lots of ways to get out and get active with family or friends as the neighbourhood is surrounded by parks, nature trails, biking paths, sports facilities and nearby golf courses. For those seeking an exciting night on the town, the nearby highway 417 provides quick and easy access to downtown Ottawa. It’s all here for you, right at your doorstep. Fridge, Stove, Washer and Dryer for use for Tenants, New dishwasher to be installed.